As soon as I laid my eyes on the plane my heart was engulfed with anticipation and fear. I was ecstatic because of the wonderful once in a lifetime trip I was about to take. I was also a little afraid to make any mistakes while representing the East Oakland Youth Development Center (EOYDC). This was my second time going out of state and it was an opportunity that opened my horizons as far as college is concerned. From day one the trip was nothing less than outstanding and I have had an experience that has impacted my life forever. Through Ms. Regina, EOYDC and Southwest Airlines, I got to go to Washington DC. The official day 1, October 27th, began with a bang. We started off the morning by having a tour of the White House. Ever since that first tour I have concluded that seeing pictures of places such as historical landmarks and memorials is nothing like actually being there in person. Later on that day we visited the first college of three on our agenda which was Georgetown University and my God was that an experience! We went through the storm and the rain- but we made it. It was a great example that was a life lesson that sometimes there will be rough times in your journey but you have to press your way through. We had an opportunity to meet Rosie Rios, the Treasurer of the United States as well as go to the World Bank. If you really don’t know her just look on the bottom left hand corner of the front of your bills and you will see her signature there. The lady who escorted us in told us that over the years the past few treasurers never really met with the ordinary people even outside of the Bureau of Engraving and Printing. Not only did we get to meet a powerful woman who just so happens to come from the bay area; we received an exclusive tour of the Bureau of Engraving and Printing. We were privileged to go on the production floor, which is where they make the money. And if I could just brag a little bit more on that, they don’t even allow other people who do not work there or are in high positions to even be on the production floor. Yes, we are all of that! We had an opportunity to see money go through its process, smell its heavy aroma and we even got to touch it. Every other person touring there was a floor up looking through a thick glass wall. All that money made me think that even though there were millions of dollars in that room, that it could not buy the wonderful relationships that we made over the course of the trip. The second college we visited was George Washington University and because of this tour I was inspired to not be so narrow-minded as to only look for colleges in California. I was so stubborn that I even proclaimed to my counselor that I refused to look for colleges outside of California. My attitude was “Oh no. I’m staying in California. Point blank.” I thought that no one or nothing was going to change my mind. That is when I learned why college tours are so important, because if you never experience what a college is like then of course you will probably not be as open-minded. Another great college that we toured was Howard University. I have never really researched HBCUs (Historically Black Colleges and Universities) before and Howard was a good school although my heart is pondering George Washington University. It was a sight to see when all of the students there were my color. There were so many different shades of African- Americans from high yellow to nearest to the color black that a person could get (Okay I didn’t see a person that dark but you get the point.) I had never seen a university with all Black people! A day after our tour we went to their homecoming game and had some fun. I definitely want to research more Black universities. I cannot thank Ms. Regina, The EOYDC and Southwest Airlines enough for the phenomenal college tour trip. This trip not only helped me to explore new colleges, it helped me learn about politics, gain new relationships, reminisce on our country, meet important individuals; it was awesome! I am so glad that I joined the EOYDC family because everyone needs help from someone else. 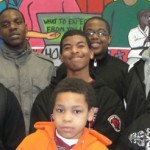 Before I went to the EOYDC, I honestly was somewhat prideful and I thought that I could do a lot of things on my own. As is the mission of the EOYDC, I have developed in this area and have had the chance to be a youth leader in the outstanding Summer Cultural Enrichment Program. When we go out to various places we proudly represent Oakland. We are able to prove to stereotypical individuals that there are young people who are taking back Oakland and are striving to make it a better community. We were chosen because we were not easily persuaded by the drug dealers on our corners. We influence our peers to get their education. We do not overlook the makeshift memorials; we are not silent about the violence. Our community is filled with broken youth who need love and encouragement and that is just what they will find at the EOYDC. The college tour has inspired me even more to want to thrive in academic excellence and I refuse to give up. My prayer is that God blesses Ms. Regina and the EOYDC to touch thousands, even millions of other lives and be able to lead our community in the path of leadership, academic excellence, community and love.